Michael has thrown two songs my way this week. They’re both from the movie St. Elmo’s Fire, and Michael told me to choose one. Well, I’m going to be difficult and comment on both of ’em. 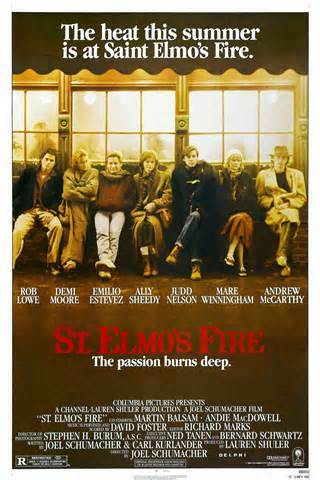 Full Disclosure: I’ve never seen St. Elmo’s Fire, so all I have to go by with these two songs is the sounds they make. I don’t have any inkling of how they relate to whatever’s in the movie. As a result, I have absolutely no emotional attachment to either song. Full Disclosure, Part 2: I never saw any of those American teen-angst movies in the 1980s (e.g., The Outsiders, Sixteen Candles, The Breakfast Club, St. Elmo’s Fire, Pretty In Pink etc.). I was the right age (i.e., a teenager), but not the right temperament (i.e., I wasn’t interested). I did see Valley Girl. But that’s all. I am, however, hideously familiar with a fair amount of the songs from those movies, due to them being played over and over again on the radio and television back then. 0:00-0:18 – You can tell immediately that this was recorded in the mid-’80s, at the height of the period for the Top 40 where the sound of real musical instruments appeared to be anathema to the commercial music industry. This is one of the reasons I loathe the music of the ’80s. In this introduction, the only thing that sounds remotely real to me is the hi-hat in the right channel, but even that sounds more processed than a hi-hat needs to be. That’s something I can say about popular music in the mid-’80s: it wasn’t big on subtlety. By the way, David Foster wrote both the songs on offer today. When John Parr started singing, it instantly brought me back to something I saw when I was finding links to the artists and songs. In the Wikipedia entry for David Foster, it quoted Rolling Stone magazine from 1985 describing Foster’s music as “bombastic pop kitsch“. I think that describes perfectly what I’m hearing. 0:34-0:43 – I like the vocal melody. 0:43-0:45 – That’s a horrible thing to do to an electric guitar. 0:46-0:49 – I thought it was funny when Jack sang the deep-and-meaningful line “You know you can’t quit until it’s won” very earnestly and it was immediately followed by the ‘brap’ of a synthesized trumpet. 0:55-0:58 – And when Jack intones in all seriousness, “Only you can do what must be done”, it’s followed by the horrible thing the producer does to the guitar. This is one way-over-produced song. The more I’m listening to the lyrics, the more I’m thinking that, instead of being placed in a teen-angst movie, this song would be better suited for a fist-pumping feel-good film – something like Rocky. I must admit that I really don’t want to hear the rest of this song. As far as I’m concerned, I’ve heard enough. I know I haven’t gotten as far as the chorus, but I know how that goes (thanks to its inescapability on the radio in the 1980s). However, I must put my personal complaints aside and persevere. 1:00-1:04 – At least it has that tune I like. It’s catchy, I’ll give it that. But John is shouting so much now that I’m surprised he doesn’t have a sore throat. Trivia: The two notes of the synthesized trumpet at 1:21-1:22 sounds to me like it’s blowing a raspberry. 1:28-1:30 – The sound that John makes here at the end of the chorus is… um… ah… I don’t quite know how to put this delicately, so I’m just going to have to come right out and say it. John sounds like he’s sitting on the toilet, and he’s constipated, and having a hard time. Note to John Parr: If you ever get to read this, John, I’d like to sincerely apologise for the previous two paragraphs. They were uncalled for. 1:31-1:30 – Back to the verse. Why on Earth was that dive-bombing sound (1:33-1:35) put in the song? What purpose did it serve? And what made that tinkly series of notes from 1:35-1:36? Was that some sort of keyboard? From 1:41-1:44 is a background singer who sounds like Michael McDonald. I don’t think it is Michael McDonald, just someone who’s trying to sound like him. 1:53-2:01 – It’s the tune I like. 2:01-2:27 – And the chorus I don’t need to hear again. I’ve heard it more than enough thank you. 2:27-3:06 – Ah, that was a slight surprise. This is the middle eight (which wasn’t a surprise at all), but what was unexpected was the chorus preceding it. At 2:19 the chorus went into double-chorus mode, but when the chorus repeated itself it last only half a chorus. In other words, it was a chorus-and-a-half. Odd. Anyway, now we’re in the middle eight. In this (rather long) middle eight are the lyrics, “Just once in his life / A man has his time” (2:49-2:55). Oh dear, this is one earnest song. I do hope Mr. Parr’s constipation clears up. 0:00-0:15 – What’s going on here? This is supposed to be a love theme, and instead of strings – a real, actual string section – it’s all played on a synthesizer. What gives? Oh, that’s right. It’s the mid-’80s. I forgot. 0:31-0:33 – Oh no, it’s that “ice crystal” synthesizer sound. This music is now reminding me of a track by ABBA called “Crazy World“. 0:46-1:00 – Yuk. Mid-’80s drums. 1:00-1:01 – And double yuk for that horrid synthesizer tom-tom fill. What’s wrong with using real tom-toms? Oh yeah. The mid-’80s. 1:17-1:28 – This is the next part of the song, and I can’t think of anything – positive or negative – to say about it. This is not my kind of easy listening. Herb Alpert, Bert Kaempfert, James Last et al – Yes. David Foster – No. 1:28-1:43 – Another part of the song. I don’t know if this a repeat of something played earlier in the track, because my mind has turned to mush. 1:43-2:13 – A saxophone solo. Of course. 2:13-3:31 – The rest of the track. Mush. I’m glad the whole thing was only three-and-a-half minutes long. You are currently browsing the archives for the John Parr category.